Since the end of last school year and through out the summer, I've been so excited to hear that so many of my Tweeps moving into technology integration positions. My position is called Educational Technology Specialist. 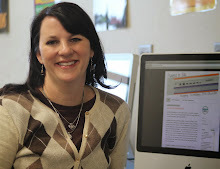 Others are Instructional Technology Specialists. Some of Technology Coaches. Whatever the title, we all want to help teachers integration technology into their classrooms. This will be my 3rd year as an ETS and I wanted to share my process. First, I should tell you that I'm totally and completely spoiled. I work on at a small middle school. I have 5 of 7 periods available to work with teachers. I am plenty of machines. And my principal is completely supportive. Finally, you should know that I'm a rare breed (I think) of educators who absolutely love a model. I the love SAMR model of technology integration. It's so elegant and simple. To me, it matches to Bloom's very well and teachers are usually very comfortable with Bloom's. Okay, down to business. When I meet with a teacher I use this form. You can download it here. I either have a hard copy of the form or I upload it to my Penultimate app and write on it that way. You'll notice that after the teacher name and subject is a place to write the TEKS. The teacher supplies the core area TEKS and supply the Tech Apps TEKS. This is first to reiterate the importance of standards over tools. Next, we talk about what we want the students to do: Interact, Manipulate or Produce. Then we decide what level of SAMR that project falls into. I've added the SAMR section for the coming school year so I'll let you know how it goes. We then describe the lesson and technology to be used. This is the real magic, where I get to introduce the teacher to exciting new tools. I also work hard to trouble shoot in this section as far as things that may go wrong and how the long the project should take. The next section is administrative, things I need to do to plan for the technology portion of the lesson. The my role (Aimee's role) section where I make notes of anything special I need to do to prepare for the lesson. After the meeting, I place of copy of the form in the teacher's box so he or she can list the TEKS and project in their lesson plans. I also schedule the laptop cart and block off the day the lesson will be taught in my planner. The afternoon before the lesson, after school is out, I deliver the laptop cart to the teacher's room so it's there and ready to go the next morning. The morning of the lesson, I teach the entire lesson 1st period. 2nd period, the teacher and I coteach. The teacher is becoming more comfortable with the lesson and technology. 3rd period, I generally just watch the teacher teach. I'm just there for moral support and in case they forget something. After that, the teacher is on their own. Of course, I'm in the building and readily available. That's my process. I know that every campus is different but I think it's awesome to hear what other people are doing. If you're an experienced technology integrator, please write a post about your process and post in the comments! Last summer I had the privilege to participate in the #levelupbc about gaming in education organized my Matthew Winner and Jennifer Lagarde. It was such an outstanding professional development experience, I can't even tell you! So, when I started ready Mindset by Dr. Carol Dweck, I thought it would make a perfect Twitter Book Club. I posted this tweet, people responded and here we go! The premise of the book is that you have either a fixed or a growth mindset and that your mindset will determine your success. I was first introduced to the book at the PBL Collaborative training I was privileged to attend in June. I bought it that next week and am just getting into it. So far, it's been very powerful for me. I can already see how I struggle against a fixed mindset in some areas of my life. This is the second in my series about the staff development I'm doing this summer. Up today: Social Studies. This year I wanted staff development to learner centered. I asked each department what they wanted to learn more about. Social Studies wanted to be better SMARTBoard users. They have Torch Ignite multimedia curriculum and wanted to build SMART Notebooks of Torch lessons. You can learn more about Torch here. I consider myself pretty proficient with the SMART products but I wanted to make sure I wasn't missing anything so I reached out to my resident #smartee Rafranz Davis. She directed me to Lamar Consolidated ISD's iCafe. I have long been a fan girl of LCISD's C's - Chad Jones and Chris Nilsson. They are hilarious and just do things right. Not to mention that one of my favorite tweeps Paul Wagner is an instructional technology specialist in LCISD. So I knew that the resources would be top notch! I was not disappointed! The resources are extremely helpful. The C's have a one page rule and their designs are impeccable Plus the one page rule allows you to find just want you need and not worry about the rest. You can find their fine work here. After refreshing myself in the iCafe, I felt more confident. I was on the right track and could teach intelligently. I had big plans for the day but as Robert Burns would say: the best laid plans of mice and men often go astray. The server was down for maintenance the day of the training. I had intended to have the teachers sign up for the SMART Exchange. I am in love with the SMART Exchange. It's a free service where teachers post SMARTBoard lessons. You can download and customize the lessons. And you can post your awesome lessons for others to share. Since the server was down, we didn't get to do that. But the teachers could use the computers in their rooms and save locally. Lemonade out of Lemons time! I gave a brief overview of SMARTNotebook and demonstrated how to build a lesson using Torch and SMARTNotebook. Then each teacher went to his or her room to work. I spent the rest of our time together going from room to room checking on teachers and helping them. They were thrilled to have time to build lessons. Sometimes you're smarter than you think but it doesn't hurt to refresh yourself. Make sure your trainings get on the calendar so you don't get scheduled over. Give teachers plenty of time to work. 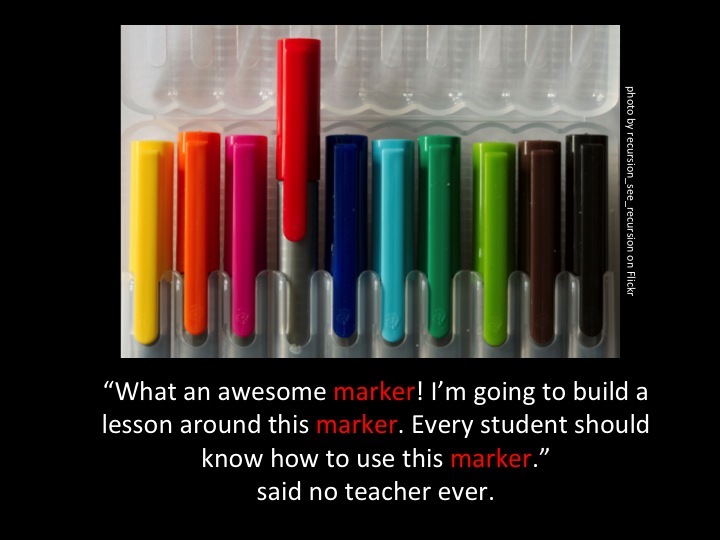 Teachers will feel more confident if they leave your training with something they can use right away. I have been overwhelmed this weekend by the power of Twitter. Earlier this week I was able to participate in a Google Hangout about blogging. Read more about that here. Now all weekend, I've seen others announce their new blogs and discuss their desire to blog. What has made my heart happy is all the encouragement. New bloggers are being encouraged by seasoned bloggers. Reluctant bloggers are being encouraged to get moving. Seasoned bloggers are sharing their wisdom with us all and being encouraged to keep up the good work. That is the power of Twitter. Twitter has allowed me to build a PLN (Personal Learning Network). Most of these educators are interested in technology integration. They are welcoming and encouraging. They get me. They are my tribe. If you haven't join Twitter yet, I'd encourage you to do so post haste! You'll find someone like you who is willing to share ideas. If you're on Twitter but don't feel connected, SPEAK UP! Reply to another person's tweet. Stick your neck out there, you'll be pleasantly surprised. The best way to feel more connected is to participate in a Twitter chat. #TXED is every Wednesday night at 8:30 CST. Cybrary Man has an extensive list of educational twitter chats here. The iPad has revolutionized lots of things. I credit iPad apps with helping my son become verbal. Is a very powerful tool. Ideally, it's a personal tool. An iPad in every student's hands would be great. But, it's just tool. 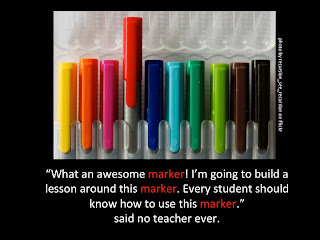 And great teachers use the all tools they have to create an outstanding learning environment. It's summer, I had the pleasure of training 17 teachers at my school on the iPad and the 1 iPad classroom. The training itself was fun. The teachers were excited and ready to learn. I was stressed. 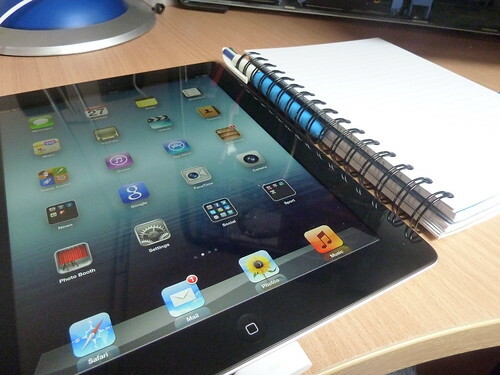 I am a prolific iPad user but I had never lead a session on its use in a 1 iPad classroom. I had done a lot of research and had tons of ideas. That was the problem. I didn't want to overwhelm them. I gave teachers plenty of time to investigate apps. My teachers are able to use their own Apple ID. They were provided with 14 district purchased apps (purchased through VPP) and given a $30 gift card to purchase apps for their rooms. We're a small school. There's only 1 teacher per subject per grade level so it doesn't make financial sense to purchase content specific apps through VPP. We do have a google doc where the teachers will rate and review the apps they purchase with their gift card. Remember to focus on the curriculum or the standard to be taught not the tech! I really WANT to be a good blogger. Or at least a better blogger. This lead to a discussion on Twitter with Carrie Ross (@MsRossEnglish) and ended with a Google Hangout with some fabulous women: Jaime Vandergrift (@JaimeVanderG), Nikki D. Robertson (@NikkiDRobertson), Leslie Whittington (@WhittClass), Carrie and I. We discussed lots of things but what really stuck with me is: just do it. You might think that what you have to say is not remarkable but it could be just the thing someone else is looking for. You owe it to the rest of use to share your "golden nuggets" - the awesome things that are happening in your room. The thing about teaching is that it can be very isolating. Blogging connects us to one another. It lets us share our successes and lament our failures. Blogging is a great way to reflect on your craft. It helps us know that we are not alone.